Active managers have been preparing for interest rates to rise for some time, gradually reducing their durations by investing in shorter-term bonds that are less sensitive to rising rates. 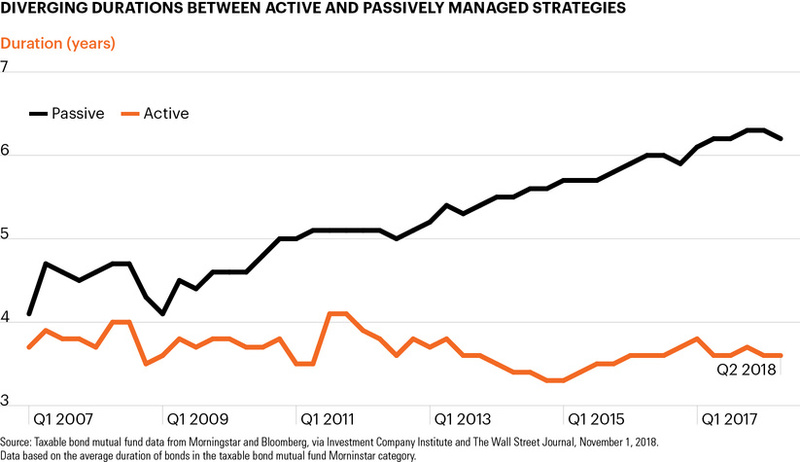 Meanwhile, the duration profile on passive strategies has risen alongside the underlying assets they track. Investors have seen volatility spike in October across both the equity and fixed income markets. Within this environment, now may be a good time for investors to consider actively managing the risks within their portfolios. 1 Bloomberg, as of November 1, 2018. 2 Taxable bond mutual fund data from Morningstar and Bloomberg, via Investment Company Institute and The Wall Street Journal, November 1, 2018. https://on.wsj.com/2RreKHl. The chart of the week and any accompanying data is for informational purposes only and shall not be considered an investment recommendation or promotion of FS Investments or any FS Investments fund. The chart of the week is subject to change at any time based on market or other conditions, and FS Investments and FS Investment Solutions, LLC disclaim any responsibility to update such market commentary. The chart of the week should not be relied on as investment advice, and because investment decisions for the FS Investments funds are based on numerous factors, may not be relied on as an indication of the investment intent of any FS Investments fund. None of FS Investments, its funds, FS Investment Solutions, LLC or their respective affiliates can be held responsible for any direct or incidental loss incurred as a result of any reliance on the chart of the week or other opinions expressed therein. Any discussion of past performance should not be used as an indicator of future results.